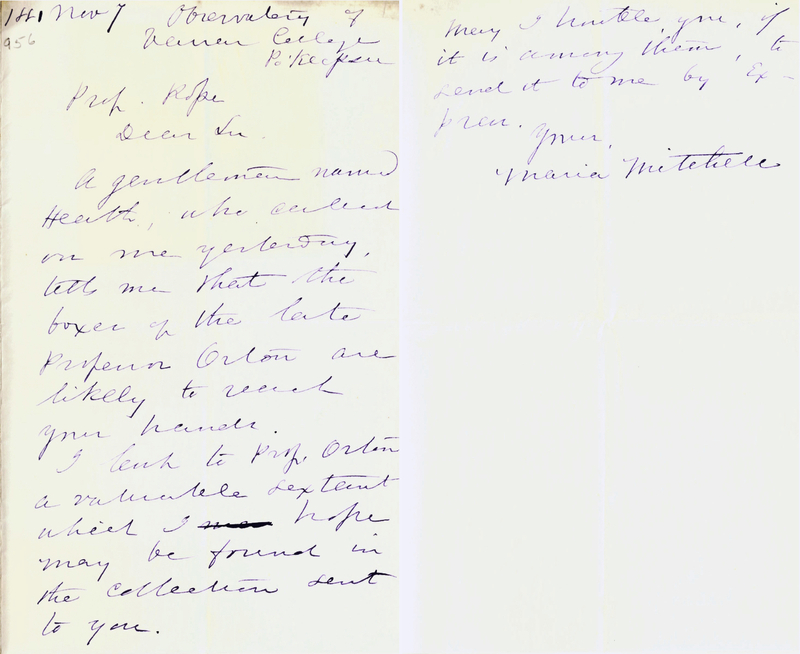 Buried in Haverford’s Special Collections is a brief letter from Maria Mitchell to E.D. Cope. When she wrote to Cope, Mitchell was a senior member of the scientific community. She was director of Vassar College’s observatory, where she was also professor of astronomy. On October 1, 1847, when she was 29, she had discovered a comet, which discovery brought her considerable fame (and a gold medal from the King of Denmark). Following her discovery she was elected the first woman fellow of the American Academy of Arts and Sciences. She spent the next two decades working for the U.S. Nautical Almanac Office computing ephemerides for Venus, was appointed to the American Philosophical Society in 1865, and in the same year she became the first female faculty member at Vassar College when it opened. By any measure, Mitchell was an accomplished scholar. 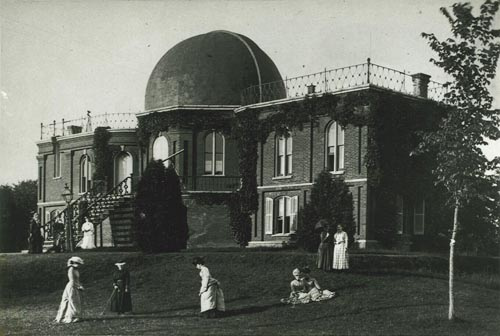 The first building completed at Vassar College was the observatory, long called the Maria Mitchell Observatory. Read more about it here, which is where I got the image. Cope too was an accomplished scholar, though his area of expertise was paleontology rather than astronomy. Although he had taught briefly at Haverford College, he didn’t seem to enjoy teaching, complaining that the students required too much time and attention, and so retired. His irritation was not limited to students and their incessant questions. When he left Haverford and moved into Philadelphia (his adjoining townhouses still stand at the corner of 21st and Pine St.) he became so annoyed by the herding of livestock down his street, that he wrote to the mayor demanding that the city outlaw it. The mayor’s response was polite but dismissive. He said he would look into it. When Mitchell wrote to Cope in 1881, she had a very specific request: she hoped he would return her sextant. Maria Mitchell’s letter to E. D. Cope asking him to return her sextant if he finds it in a box of James Orton’s things. A gentleman named Heath, who called on me yesterday, tells me that the boxes of the late Professor Orton are likely to reach your hands. I lent Prof. Orton a valuable sextant which I hope may be found in the collection sent to you. May I trouble you, if it is among them, to send it to me by Express. Apparently, Mitchell had loaned her sextant to Professor Orton. She was probably referring to James Orton, who in 1867 had borrowed various instruments from the Smithsonian for his expedition up the Amazon and into the Andes and then in 1869 had introduced natural history instruction to Vassar College. in the 1870 Orton made two other trips to the upper Amazon and the Andes. Mitchell’s sextant probably resembled this one, perhaps even with a nice mahogany case. 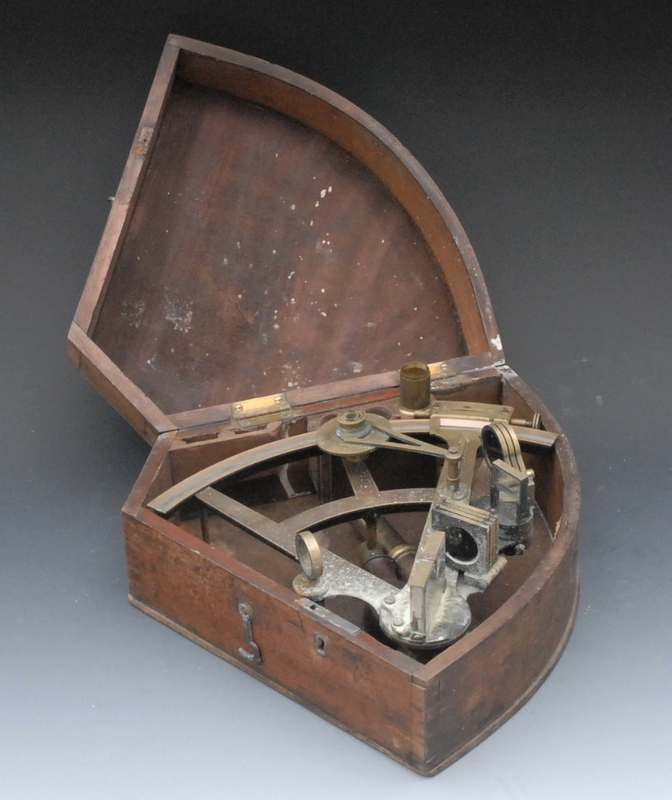 19th-century sextant’s are readily available for reasonable prices. Bamford’s auctioned this one a couple years ago. Orton’s interests in zoology and his explorations of the Andes seems to have linked Cope’s paleontology to Mitchell’s astronomy. Orton, who had a history of borrowing astronomical instruments, probably borrowed Mitchell’s sextant for one of his later trips to the Andes. We can imagine Orton exploring the Amazon jungle and the Andes using Mitchell’s sextant to chart his way. Then, after he died, Cope had arranged to acquire some of Orton’s material related to his zoological work. Apparently, Mitchell suspected that in one of those boxes Cope would find her valuable sextant. Unfortunately, we don’t know if Mitchell ever received her sextant or even if Cope replied—unfortunately, Haverford’s collection of Cope letters doesn’t include any of his responses. Maybe the observatory at Vassar College has Mitchell’s sextant now on display with other historically significant instruments. … what are the core competencies of an STS graduate? How do they differ from those of other liberal arts/interdisciplinary majors? How can STS strive to confer the type of disciplinary competence that traditional liberal arts majors offer? Given the diverse and fuzzy-bordered nature of STS as a field, I suspect that answers to questions like these will be highly local and it might be worthwhile to expose and map those differences. I think these are important questions, complicated by the fact that at many liberal arts institutions STS is not a degree or minor program. STS course work is interleaved into the students’ regular major. Here at Haverford, history majors can select “History of Science” as one of their areas of concentration. Despite some promising efforts a few years back, an STS minor never gained any real traction. Other minors and concentrations often want a history of science or STS component—e.g., Health and Society or Environmental Studies—but again, STS is subordinated to the real focus of the program. Perhaps that makes Joe’s questions all the more important. What is it that STS brings to the table that other disciplines and majors don’t? What sort of identity—disciplinary or curricular or ideological or pedagogical—does STS have? If you have suggestions or thoughts, please email them to me or, better yet, write a post at your blog and link back so I am alerted to your post.